An Ohio State biophysicist used a supercomputer to search thousands of molecular combinations for the best configuration to block a protein that can cause breast or prostate cancer. Chenglong Li, Ph.D., an assistant professor of medicinal chemistry and pharmacognosy at The Ohio State University (OSU), is leveraging a powerful computer cluster at the Ohio Supercomputer Center (OSC) to develop a drug that will block the small protein molecule Interleukin-6 (IL-6). The body normally produces this immune-response messenger to combat infections, burns, traumatic injuries, etc. Scientists have found, however, that in people who have cancer, the body fails to turn off the response and overproduces IL-6. "There is an inherent connection between inflammation and cancer," explained Li. "In the case of breast cancers, a medical review systematically tabulated IL-6 levels in various categories of cancer patients, all showing that IL-6 levels elevated up to 40-fold, especially in later stages, metastatic cases and recurrent cases." In 2002, Japanese researchers found that a natural, non-toxic molecule created by marine bacteria  madindoline A (MDL-A)  could be used to mildly suppress the IL-6 signal. 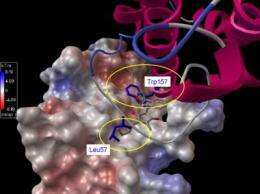 Unfortunately, the researchers also found the molecule wouldn't bind strongly enough to be effective as a cancer drug and would be too difficult and expensive to synthesize commercially. And, most surprisingly, they found the bacteria soon mutated to produce a different, totally ineffectual compound. Around the same time, Stanford scientists were able to construct a static image of the crystal structure of IL-6 and two additional proteins. Li recognized the potential of these initial insights and partnered last year with an organic chemist and a cancer biologist at OSU's James Cancer Hospital to further investigate, using an OSC supercomputer to construct malleable, three-dimensional color simulations of the protein complex. "The proximity of two outstanding research organizations  the James Cancer Hospital and OSC  provide a potent enticement for top medical investigators, such as Dr. Li, to conduct their vital computational research programs at Ohio State University," said Ashok Krishnamurthy, interim co-executive director of OSC. "We proposed using computational intelligence to re-engineer a new set of compounds that not only preserve the original properties, but also would be more potent and efficient," Li said. "Our initial feasibility study pointed to compounds with a high potential to be developed into a non-toxic, orally available drug." Li accessed 64 nodes of OSC's Glenn IBM 1350 Opteron cluster to simulate IL-6 and the two additional helper proteins needed to convey the signal: the receptor IL-6R and the common signal-transducing receptor GP130. Two full sets of the three proteins combine to form a six-sided molecular machine, or "hexamer," that transmits the signals that will, in time, cause cellular inflammation and, potentially, cancer. Li employed the AMBER (Assisted Model Building with Energy Refinement) and AutoDock molecular modeling simulation software packages to help define the interactions between those proteins and the strength of their binding at five "hot spots" found in each half of the IL-6/IL-6R/GP130 hexamer. By plugging small molecules, like MDL-A, into any of those hot spots, Li could block the hexamer from forming. So, he examined the binding strength of MDL-A at each of the hexamer hotspots, identifying most promising location, which turned out to be between IL-6 and the first segment, or modular domain (D1), of the GP130. To design a derivative of MDL-A that would dock with D1 at that specific hot spot, Li used the CombiGlide screening program to search through more than 6,000 drug fragments. 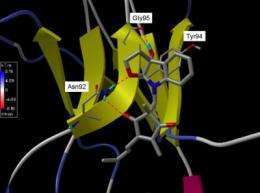 So far, he has identified two potential solutions by combining the "top" half of the MDL-A molecule with the "bottom" half of a benzyl molecule or a pyrazole molecule. These candidates preserve the important binding features of the MDL-A, while yielding molecules with strong molecular bindings that also are easier to synthesize than the original MDL-A. "While we didn't promise to have a drug fully developed within the two years of the project, we're making excellent progress," said Li. "The current research offers us an exciting new therapeutic paradigm: targeting tumor microenvironment and inhibiting tumor stem cell renewal, leading to a really effective way to overcome breast tumor drug resistance, inhibiting tumor metastasis and stopping tumor recurrence." While not yet effective enough to be considered a viable drug, laboratory tests on tissue samples have verified the higher potency of the derivatives over the original MDL-A. Team members are preparing for more sophisticated testing in a lengthy and carefully monitored evaluation process. Li's project is funded by a grant from the Department of Defense (CDMRP grant number BC095473) and supported by the award of an OSC Discovery Account. The largest funding areas of Congressionally Directed Medical Research Programs (CDMRP) are breast cancer, prostate cancer and ovarian cancer. Another Defense CDMRP grant involving Li supports a concurrent OSU investigation of the similar role that IL-6 plays in causing prostate cancer. Those projects are being conducted in collaboration with Li's Medicinal Chemistry colleague, Dr. James Fuchs, as well as Drs. Tushar Patel, Greg Lesinski and Don Benson at OSU's College of Medicine and James Cancer Hospital, and Dr. Jiayuh Lin at Nationwide Children's Hospital in Columbus. "In addition to leading the center's user group this year, the number and depth of Dr. Li's computational chemistry projects have ranked him one of our most prolific research clients," Krishnamurthy noted.